From the Southern State Parkway: Exit #40 South onto Robert Moses Causeway. Proceed 5 miles. 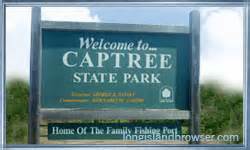 Take the second exit after the drawbridge to Captree State Park. From 495 - Long Island Expressway: Continue on LIE to Exit 53 (Sagtikos State Parkway). Go South on Sagtikos State Parkway, towards Ocean Beaches. When you come to the fork in the road, stay on Southern State Parkway West. (To the right). Stay to the right side of Southern State Parkway for about a quarter of a mile. Once you go past Bay Shore Rd. Get off at Exit 40 South Robert Moses Causeway (Towards Ocean Beaches). Continue South on Robert Moses Causeway (over two bridges) follow the signs for Captree State Park. From Meadowbrook and Wantagh Parkway: South to Jones Beach. At the traffic circle, head east 14 miles on Ocean Parkway. Ocean Parkway ends at the Captree State Park. From Northern State Parkway : Northern State Parkway to Exit 44S (Sagtikos State Parkway). Go South on Sagtikos State Parkway, When you come to the fork in the road, stay on Southern State Parkway West (to the right). Stay to the right side of the Southern State Parkway. Once you go past Bay shore Rd. Get off at Exit 40 South Robert Moses Causeway, (Towards Ocean Beaches). Continue South on Robert Moses Causeway, go over Bridge. TakeOcean Parkway East - Captree State Park. Please note that there is an $8.00 entrance fee to the park. The Captain Eddie B III is located to the right of the main pavilion (Captree Cove Restaurant) near the Bait Shop.